The Aug. 14 bridge collapse in Italy that killed 43 people has renewed concern about ailing U.S. infrastructure and prompted fresh looks at ARTBA’s Bridge Report. Reporters from the Baltimore Sun, FOX News, Newsweek, the New York Times and New York Post, the Economist, the Chicago Tribune, local television and radio stations, and industry outlets, have cited ARTBA’s annual report on the state of America’s bridges. Nearly 66,000 people visited the website in the week following the tragedy, most – nearly 50,000 – after viewing NBC TODAY’s look at what it means when a bridge is in “poor condition”. 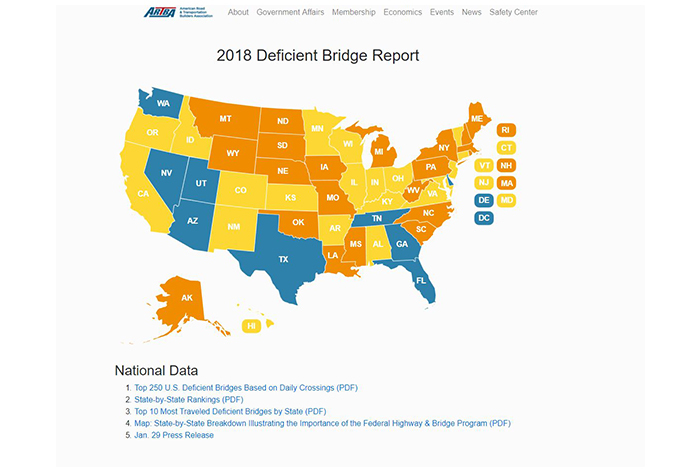 TODAY’s online story directed viewers to the 2018 ARTBA list of deficient bridges by state and congressional district, resulting in more than 211,000 page views. Of the nation’s more than 612,000 bridges, 54,259 are considered “structurally deficient” and, even more concerning, one in three bridges, or 227,000, have been identified as needing repairs, according to the ARTBA report, which uses U.S. Federal Highway Administration data. At the current pace of repair or replacement, it would take 37 years to remedy the situation, ARTBA’s Chief Economist Dr. Alison Premo Black said.